Are you tired of clicking and trying to connect using dial-up internet connection? Well, save some time and effort using free utility connection keeper. This application simulates Internet browsing (at a random interval) and prevents connection from appearing idle, thus preventing your ISP from dropping the connection due to inactivity. It also automatically closes pop-up windows asking to stay connected and keeps dialing till your are connected. It sits on the system tray and does not cause much strain on system resources. It is not bandwidth hogger and keeps your dail-up working by reconnecting it automatically (if connection drops). 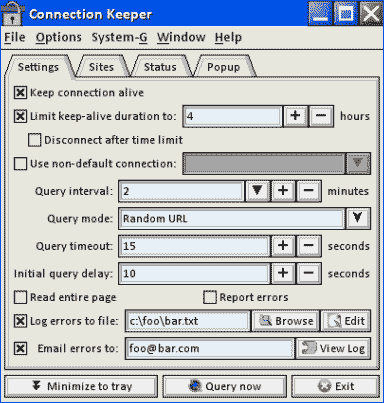 Download Connection Keeper [link], works fine on Windows 98, ME, XP, Vista and saves you lot of time and effort!